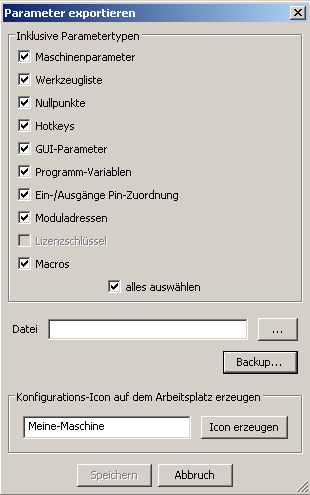 After you have set all parameters, making a backup of the settings is recommended. In the event damage to the PC causes a loss of data, or you have accidentally made erroneous changes, you can easily restore the original parameters once more and then you do not have to make all the changes again. In order to save the parameters in a file, select „File-> Export Settings“ from the menu. You can find more details in the The File Menu chapter.